Hello, and welcome back on my blog! 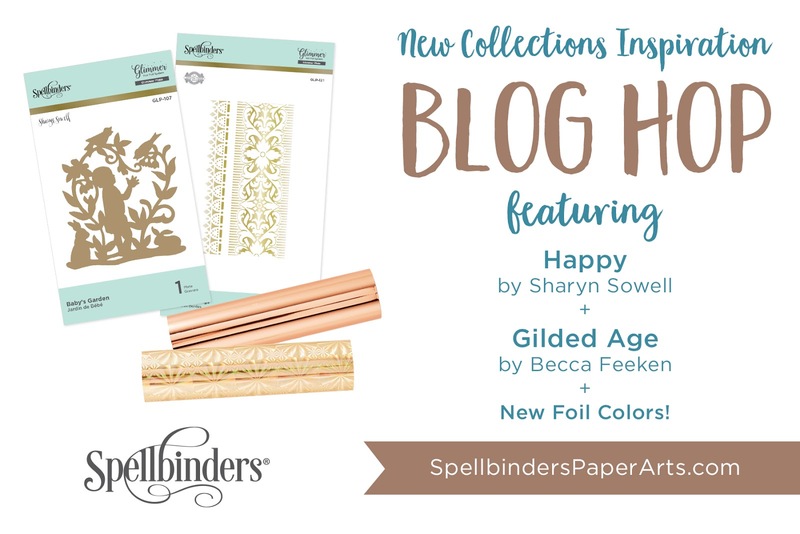 Today I have joined the Spellbinders Blog Hop and I am featuring the Becca Feeken Gilded Age and Sharyn Sowell Happy collections. Today I am showing you two cards with the new releases. 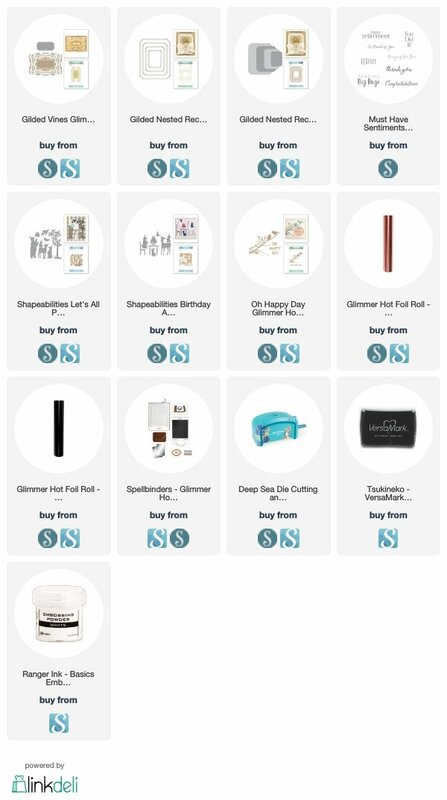 As always, you can find all the used supplies below. For my first card I used the elegant Glided Vines Hot Foil Plate, Nested Rectangle Glimme Set and the Nested Rectangle Dies set from Becca Feeken. As you can see I made hot foiling on the edges of the layers. For this I used the Rose Gold foil and Glimmer Hot Foil System. When the hot foiling was done I die-cut the layers with the coordinating dies. For the middle layer I made dry embossing with the beautiful Vines Glimmer Hot Foil Plate on a piece of chipboard. 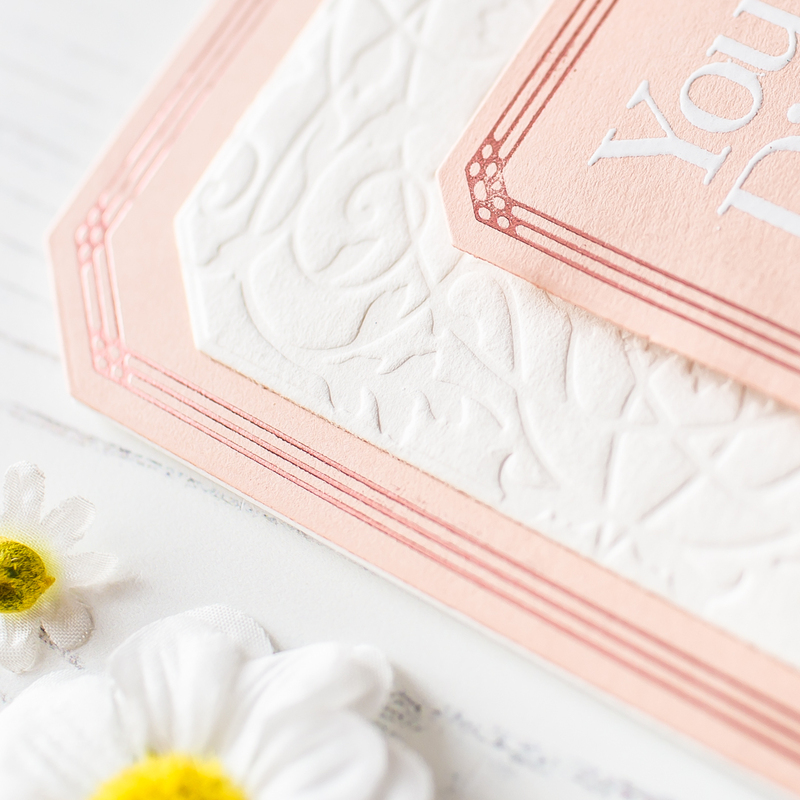 For the smallest part I stamped the sentiment from the Must Have Sentiments Stamp and heat embossed it with White embossing powder and put everything together. For the second card I used the Sheapeabilities Birthday Animals and Let's All Party! Etched Dies from Sharyn Sowell. 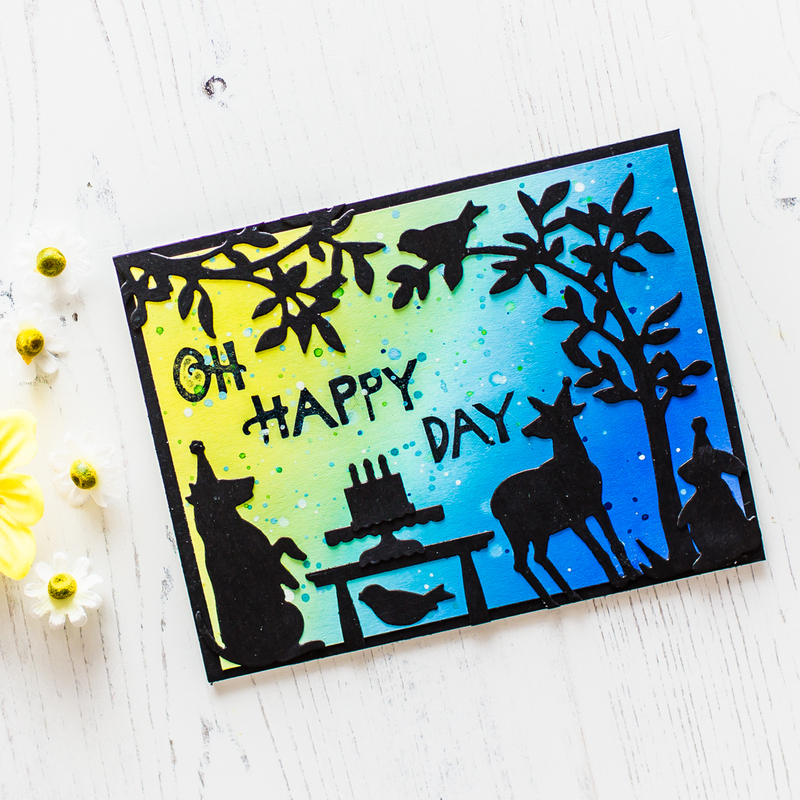 I started the process with Ink blending in the background and when it was done I used the Oh Happy Day Hot Foil Plate also from Sharyn Sowell and Foiled the sentiment with Black Foil to the background. Next I made Die-cuts with the mentioned dies and black cardstock. Before I adhered everything together I added splatter to the background and my second card was ready. 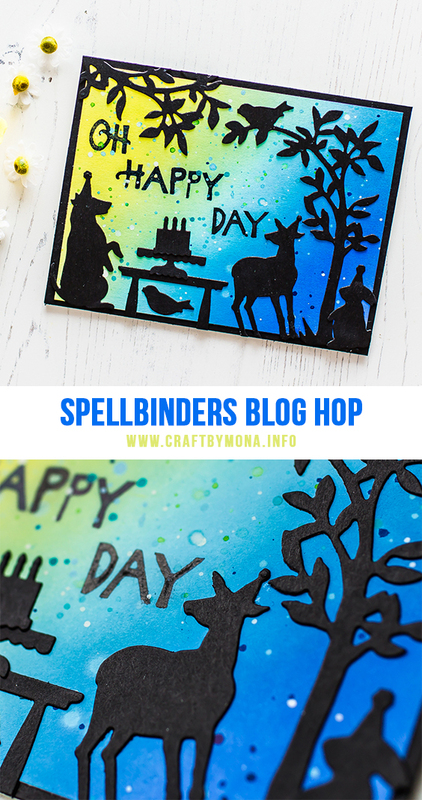 To celebrate this release, Spellbinders is giving away a $50 gift certificate to 3 lucky blog readers – selected from the comments across all of the blogs in the hop. Giveaway closes on Sunday, April 7th 11:59 pm EDT. Winners will be announced in Spellbinders blog hop post the following Monday. Winner is responsible for shipping cost, duties and taxes. Beautiful cards. Creative use of the rectangle dies to make the unique shaped cardI love the colors you used on the oh happy day card. Your first card is simple but elegant the second card is so much fun with the die and colorful background. SO Beautiful!! Love the neat look of the first card with foiled details and the gorgeous color blend on the second! The second card is so colorful and whimsical! I love your first project for its unique shape. So versatile. Lovely! Wow your two cards are worlds apart, but both beautiful and inspiring. I love the colourful, whimsical look of your second card. What fun and the colour blend is awesome. Your first card is so elegant and rich looking. Inspiring. Such pretty cards Mona. 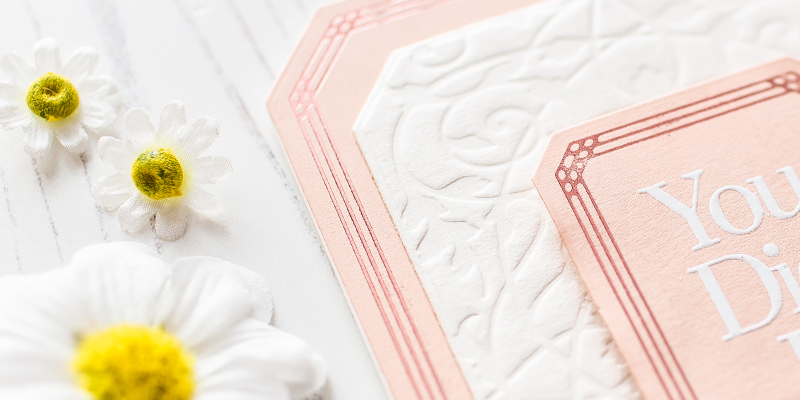 Love the elegant look of the pink with the delicate hot foil border... the touch of dry embossing looks nice... that silhouette image on the second is awesome... great background! I love these totally different styles of cards! The pink and white is my favorite and it is simply gorgeous. So elegant and so whimsical. I love both! love your creations! 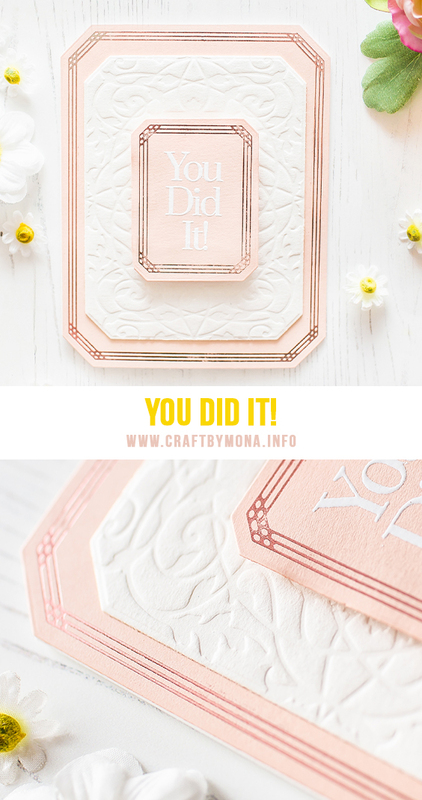 The YOU DID IT card is so beautiful! I could have used this idea for my nephews graduation. I really like it - so simple and elegant. The first card is so elegant! Love the color and that die on the second one! I love both of your cards, so different. Classy and fun. Thanks for sharing your cards. 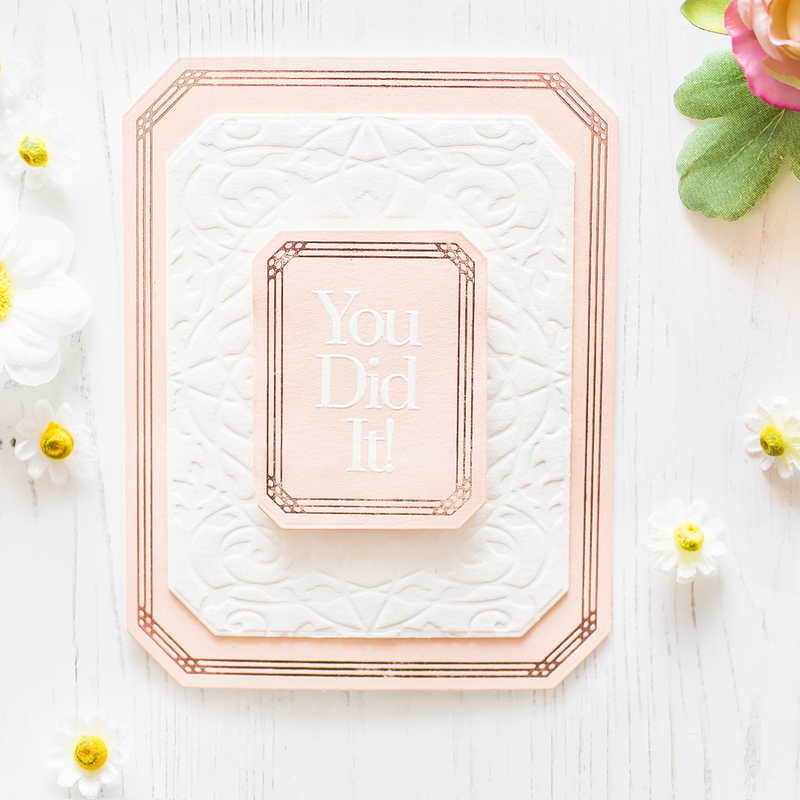 Like the You did it card. Oh, I LOVE the animals!!!!!!! This is such a happy scene. Love the versatility you showed with both of your projects. lovely cards - The soft colors on the first card is awesome!! Am in awe of your layering and match up with the foil plate on the first one!! Especially the Rose color! Both of these designers and you are so amazingly talented! 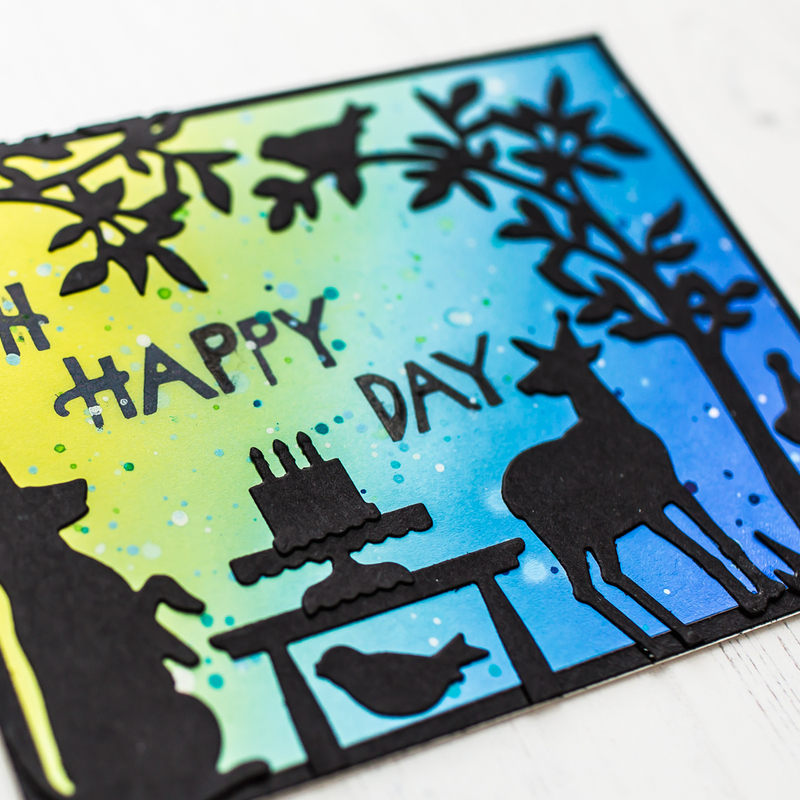 The Animals are just fun with that gorgeous blended background too! I was so happy to see you use the frames (which I just received). 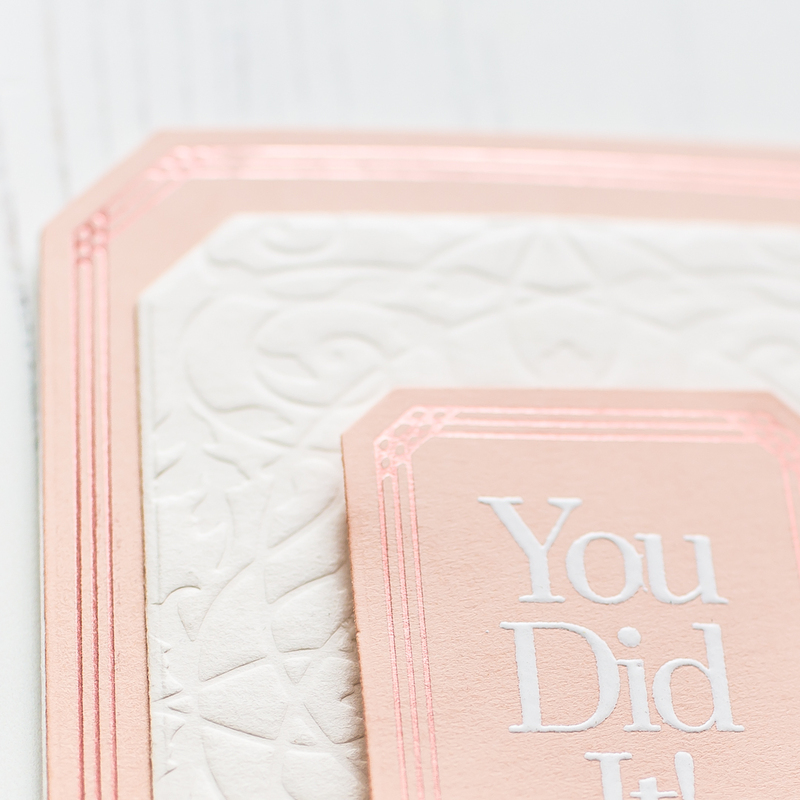 They're beautiful with the rose gold on the pink cardstock! And the animals card is so fun. Beautiful cards! The pink card is so elegant, and the party animals are adorable! The first card is elegant and stunning. Love the fun of your second card. You are sooo creative. You Did It! Two beautiful cards! I loved your cards. Thanks for sharing. Delightful cards! 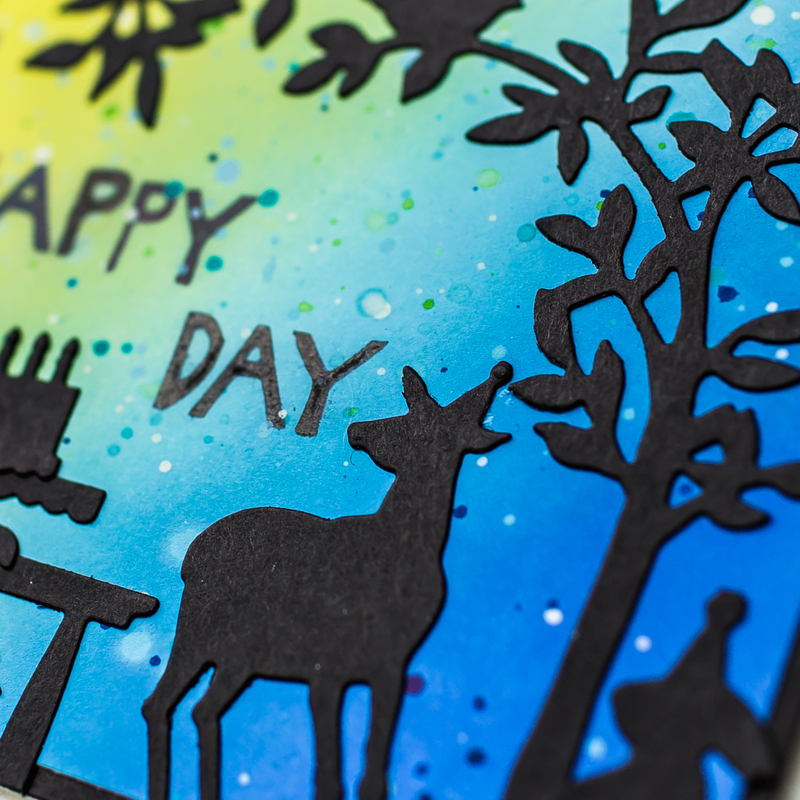 Love how your first card incorporates glimmer foil, embossing & die cutting to create an elegant card. Your first card is so elegant and the second is so much fun! Love them both. I LOVE the oh happy day card!! Such wonderful cards. The first one is so lovely and the second one so amazing! Both cards are beautifully done. Love the simplicity of the first and the fun elements of the second. Thank you for sharing. I LOVE the silhouette card! And soft colors of the pink one! Love the blended background card. That silhouette is so much fun. I keep eyeing it, but haven't take the plunge yet to get it. It is on the wishlist though. Pretty cards! The first on eis so elegant. Love the simplicity of the first elegant card and that you used hot foil dies for embossing without foil, and with foil. Another great idea for these wonderful, intricate designs. The animal party is also delightful. TFS. Your cards are so beautiful! I already got the rectangles and I can't wait to try them. You are providing wonderful inspiration! Love your cards especially the party animals. So dramatic with the silhouettes. Gorgeous! The cute critters pull at my heart strings every time!! Both cards are lovely, Mona. Beautiful color blending Mona....Both the cards are lovely!! Both cards are gorgeous! The foil adds nice detailing to the first card and I LOVE the bright blended colors for the second card. These look great! I really like the rectangles. The background on the animal set looks wonderful. I like the trees from that set. Love both of your cards and they are so different from each other. That rectangle foil card is just beautiful! Pretty and elegant first card and fabulous colors on the second. is so elegant - simple and beautiful. Your cards are beautiful! I really like the silhouette card. Awesome cards. I love how you used the rectangle frame and the choice of foil color stunning. Such beautiful details, colors and textures! Lovely cards! Fabulous cards! Gorgeous and fun. Love the elegance and retro feel of the nested rectangles. Beautiful cards. Love the gorgeous soft colours of the first card. And I adore the boldness of the second card. Awesome combination of elegant and whimsical!!! Love it! Both are so pretty. Love the clean lines of your first card and the beautiful colors of your second. Thanks for sharing. Gorgeous cards. I first one is so unique, and the colors on the second one are amazing. Love them both. Beautiful design and great job. Love your style and your techniques are amazing. Your blog it is wonderfulI can't wait for your next post.